Like many sculptors, past and present, Bruning works in a variety of series composed of closely related forms and ideas. One of these is Street Conversations which usually involves themes of people meeting in public areas, reflecting their interaction. 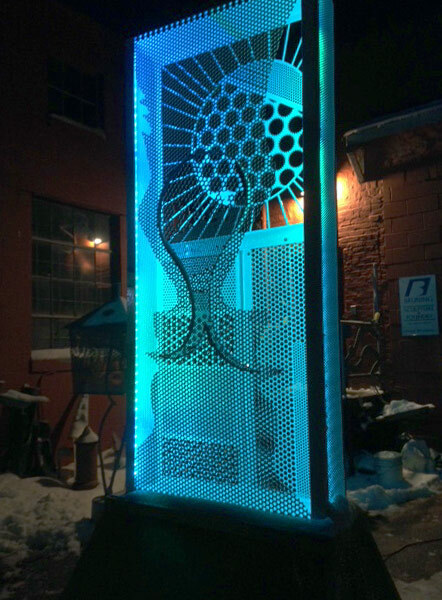 Frequently, the sculptures use perforated metals with translucent qualities further enhanced by active LED lights, mechanical movement, and sound. Meet & Greet is one of a series of sculptures that I refer to as a “street conversations” In a civil society, we need to talk to each other in an open and friendly way if we are to co-exist peacefully. 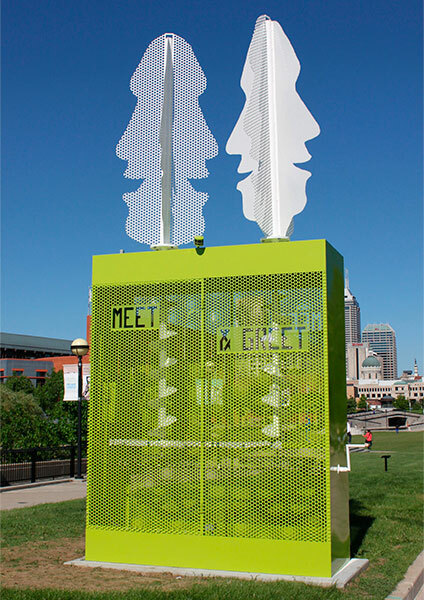 In this sculpture, the faces (each face is 8’ tall) come face to face with each other as the interactive cranks are manually turned. This artwork demands participation to create the daily activity of facing our fellow citizens. A motion sensor triggers a sound track of four short sentences that repeat. The sentences are: Effort has its rewards. Rewards give us pleasure. Pleasure wins us friends. Friends make life rewarding. Three Way Conversation is designed to engage with the people passing by the sculpture in the same manner they would another person. From one side, two images are apparent and from the other side one of the faces is visible. As the viewer looks closer and as the light changes the three faces come together as if having a conversation with each other. The ephemeral ways the faces interact and change simulate a personal exchange. 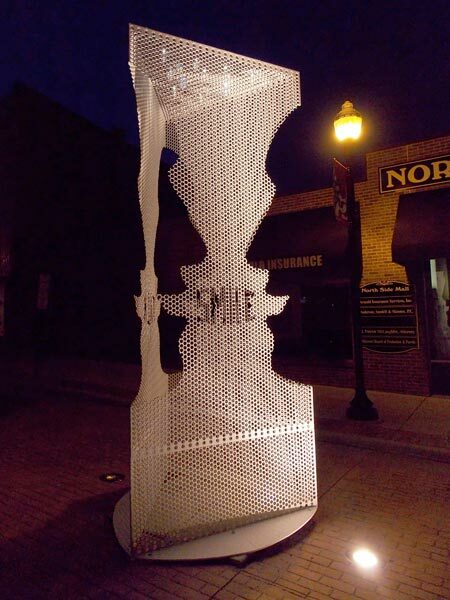 TALK-TALK-SMILE is a street conversation that determines the quality of life on a neighborhood street. Neighbors need to converse with each other and they can be most effective if they do it with a smile on their face. 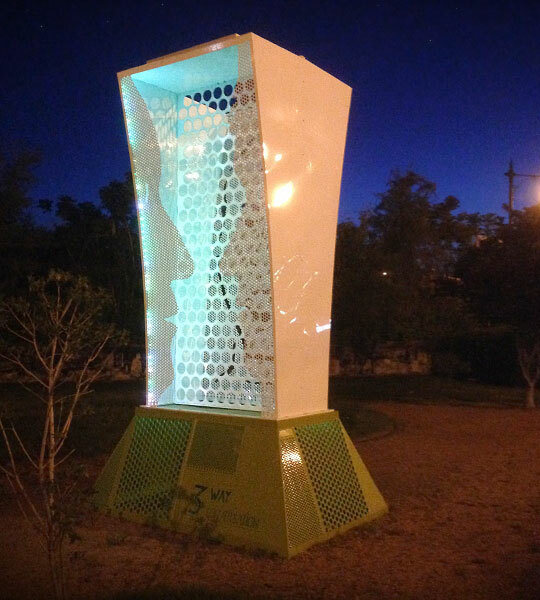 The perforated stel creates a translucent quality that brings the faces and words in and out of focus and allows the viewers to see each other in the neighborhood through the sculpture. This encourages a sense of shared space on the street. 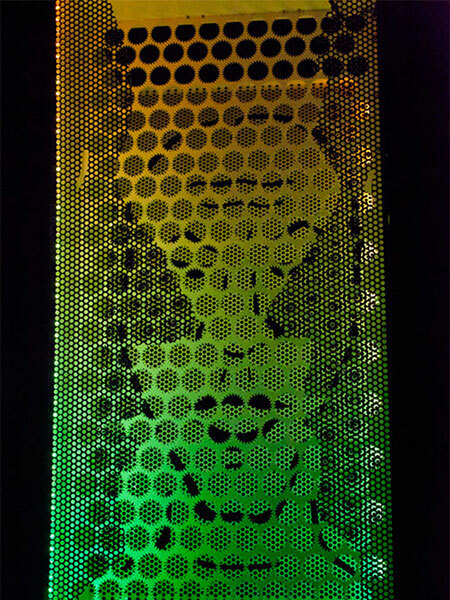 Duet features two cut out faces in perforated steel that face each other. In between is voice bubble that says Duet. On each side are strings of LEDS that are programmed to change colors and at times uses running lights. The patterns always begin at the mouth of each face. At the same time a voice track with a man’s voice and a woman’s voice sing notes. The voices are of a controlled volume so that the viewer needs to be within ten feet of the sculpture to really hear them. The range of color and movement of lights is amazing as can be seen in the images. It needs to be plugged into an 110V electrical outlet, but uses very little power.